Here is something a little different, spotted by one of my friends at Anglian parked up outside the Beccles yard yesterday morning. It is obviously a Mercedes trolleybus, so that rules out anything new for Anglian. It is also European, probably German or Austrian judging from the two visible words if you zoom in. But it has a British registration - HMT193J -- however if you search for that it draws a total and complete blank. So can anyone shed any light on this trolleybus and what it is doing here? Many thanks to my contact at Beccles for sending the pics in. Where has 135 come from? It is now time to eat some humble pie. When I was riding First Yarmouth's recent arrival, B7tl Gemini 32348 last week I commented confidently to my travelling companions that one of the reasons it was in such good condition was because it hadn't spent several punishing years in London or been converted from double door. I am also reliably informed that the fleet number, currently showing 32438 will be corrected very soon! While browsing the other blogs last night I was drawn to something Clive posted on Ipswich Bus Blog regarding restoration of a service in North Ipswich. Last year service 19 to Dale Hall and Castle Hill was curtailed, leaving many elderly residents with a 500 yard walk to the nearest bus stop through one of the less desirable areas of Ipswich. To say they were nonplussed is an understatement, and the residents were vociferous in their protests. However the protests fell on stubbornly deaf ears, and only a few weeks ago I heard Jeremy Cooper, MD of Ipswich Buses basically say sorry but tough on a phone in on Radio Suffolk when asked about that route. So the local MP for North Ipswich, Dan Poulter got involved, and surprise surprise all of a sudden they can run a bus service to serve those elderly residents again. Initially only one each way a day but it is certainly better than nothing. What those residents of Stratford Court and others nearby need to do is use that bus as often as possible, persuading those who never used it before to try it out, so that it makes sense to restore the old frequency again. Well done to the residents for not giving up, and well done to Dan Poulter for taking an interest in a topic most MP's shy away from. Shows it can be done. I wonder when the last time Therese Coffey MP caught a bus was. Whilst on the subject of restoring services I had a meeting with First Eastern Counties on Tuesday to discuss the restoration of connections at Saxmundham for primarily train services, but also for those in Kelsale who travel into Saxmundham on the 196 for onward bus connections to Ipswich and Aldburgh. I suggested simply moving most off peak services on the 64 by 30 mins would achieve all objectives. It's important to remember that enough time has to be allowed for late running, both buses in the morning and trains in the evening so I felt a 20 - 25 min connection window was prudent bearing in mind neither bus or train in the area is a 10 min service! I have also asked that the timetable for the 62 which runs between Saxmundham/Framlingham/Wickham Market and Woodbridge be included in the 64 timetable so passengers can see all available services on the route. I was assured that if practically possible the changes would be incorporated, but I am aware the retimings may cause a couple of planning headaches regarding school services so we can only keep our fingers crossed. However I know First are aware that good connections mean increased patronage so I am hopeful of a positive outcome. My thanks to First for allowing me the opportunity to put the suggestions forward and I will await with interest the outcome. Monday sees the latest cuts by Go-Ahead come into force, and while in a chilly Yarmouth yesterday I took the opportunity to snap a destination screen that after tomorrow (Saturday) will be no more. Not only is the 61 disappearing from Yarmouth, being replaced by the extended 7, but Kessingland Beach will no longer be a terminus, with a few Southwold services serving the Beach en route. It does make you wonder just how much more Go-Ahead can cut now without sinking completely. Isn't that something! When I first saw this odd looking bus I assumed it had come from the continent and been converted to right hand drive or something but not so. I will use Ian Fuller's excellent description of her. My claim to fame is that the very first decker I drove in service was one of the 92 seaters, at the time the biggest in the country. The bus is an East Lancs-bodied Scania K92, the only one of its type in the Boro'line fleet, and boy is it ugly. I've always been a bit ambivalent towards East Lancs bodies - occasionally they've produced something really original and striking (the 1960s/1970s standard body design on Atlanteans, such as for Bolton and Southampton, springs most readily to mind), but most products from Blackburn seemed to have been thrown together from whatever was in the parts bin and were... er... aesthetically challenged. Maidstone 207 is definitely a case in point. Was the body intentionally designed like this, or merely assembled? Three Scanias were bought new by Maidstone. The other two were giant double-deckers on the same K92 chassis, and were no better looking. They were, when built, the most capacious double-deckers in Britain with 92 seats, but looked like glorified pantechnicons. 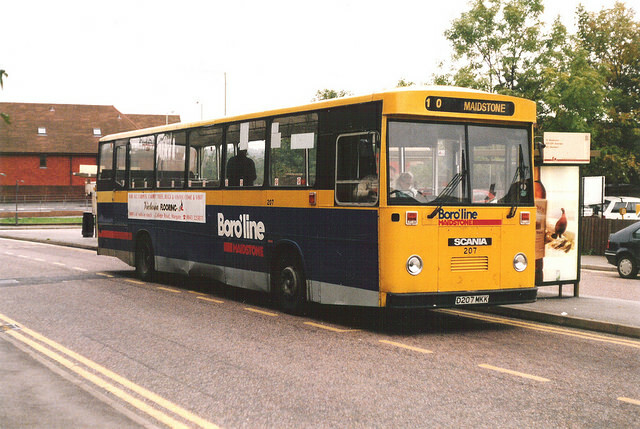 When Boro'line collapsed, and Maidstone & District acquired the remaining vehicles and the depot, this was the last bus to be sold, perhaps due to its dowdy appearance. 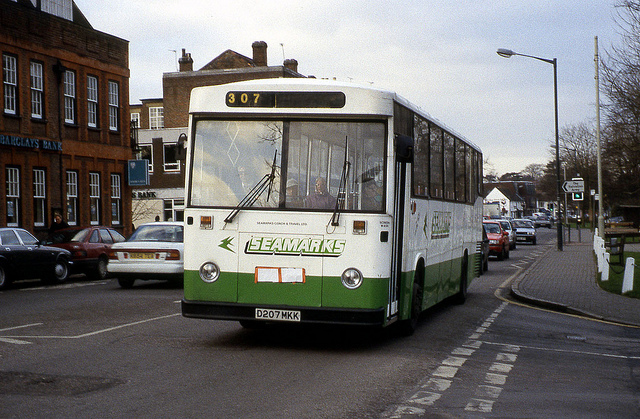 Seamarks of Luton eventually took it away. Perhaps they got a bargain. What Ian doesn't mention is the gearbox. I have tried unsuccessfully to find out the name of it, but it was a 10 speed manual box with a splitter on a stick, meaning no actual gearstick. Everything was done on a LCD display - a number flashed saying which gear you were going into, you dipped the clutch, waited for two beeps, lifted the clutch and carried on - much quicker than it sounds. I adored 207, and it must be said that after due consideration if I could go back in time and drive any bus from my past again I'd choose this one. Looks can be decieving and this was an absolute gem. Sadly it seems 207 is no more - a quick search shows she is not taxed or insured, so unless she is in storage somewhere this quirky yet brilliant bus is now a fridge or something! On the preservation front I can reveal a momentous event is happening in the coming days. Keep an eye on East Norfolk Bus Blog for first news. On Wednesday I posted a feature on the Dennis Domino, in particular the one I drove in Kent in the early 90's, C53 HDT (see here). 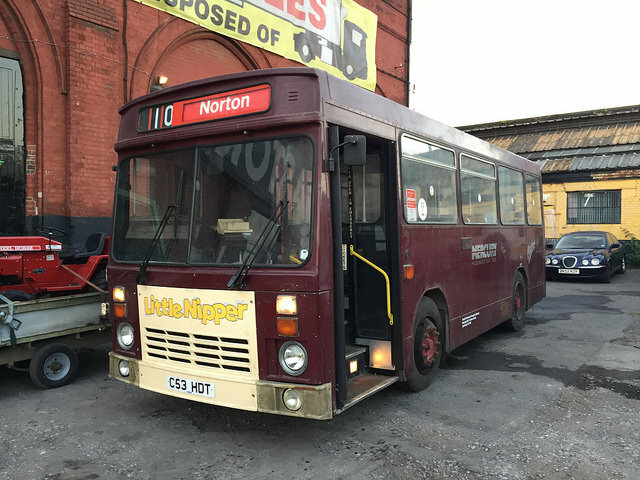 Following my post the current owner, Iain Bostock-Frith, got in touch via Flickr with one of the most incredible and heart warming stories involving a bus you will ever read. It gives me such pleasure to reproduce it here - especially as Iain confirms I'm not going mad and it DOES have a semi automatic gearbox - and if anyone out there can help Iain with sourcing parts etc then please get in touch and I'll let him know. Since initial contact Iain has sent some additional pics of 53, which just might end up as the blog mascot at this rate! Hi my name is Iain Bostock-Frith, I have owned and saved many a SYPTE bus in my time, but I wanted to share this with you, my story of my old friend, the Dennis Domino, I hope you will find it of interest! I grew up in Sheffield, was born in 1982, as the Dennis Domino was launched in 1985. Originally built as B plates, the batch were all intended to be registered B-FET, the batch ran from 41-54. 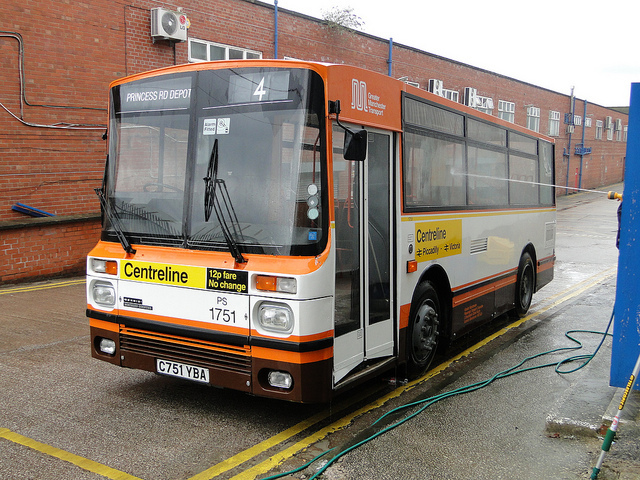 The whole batch, apart from 45, entered service late, so the C plate affix was applied, B45FET was the first one for South Yorkshire, and entered service first, therefore kept its B45FET plate the whole batch was intended to have. They all entered service spread across the SYPTE fleet, as fully automatic buses, with Avon Maxwell transmission and a Perkins t6 engine. Deregulation soon came upon us, and the Domino, being a prototype Dart therotically, and heavy fuel consumption, was soon in trouble, especially when the Dodge minibus came along being much cheaper to buy and run. The entire batch were hired out for trials with Mersey Bus & Yorkshirerider. In 1988 the whole batch were to be repainted into Little Nipper livery, and down seated so the Dodge minibus drivers could drive them, as before the whole batch were 33 seaters initially, decker drivers got decker rate for driving them. 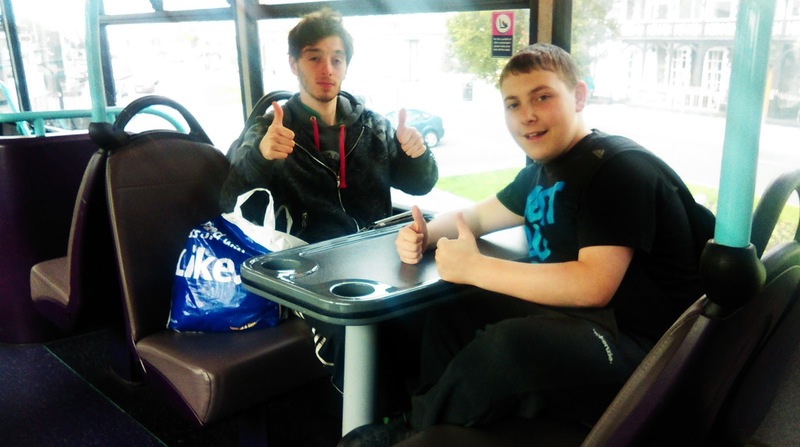 The whole batch were down seated to 25 seats (standard minibus) and a standing area created on the OS of the bus, with hanging straps to hold onto!. The batch were all converted at SYPTE's Greenland garage, at this time the Domino was experiencing a lot of issues with the compressors and gearboxes, as Avon Maxwell went bust, thus who supplied the gearboxes. This led to the wipers being converted to electric from air, to relieve the pressure on the compressor, and this is also why the wipers are off set. The gearboxes were then converted to semi automatic, same as an Atlantean that SYPTE ran, it kept the same gearbox but the operating system became more able to get parts for due to Avon going bust. My memories start from this era, from 1988 being only 6 years old, going to town with my dad, the Dominos ran on the M10 from Wybourn to Norton, and I lived at Heeley Green where the bus dropped us off literally behind the house. The sound of the whining engine, and the sheer uniqueness of these buses led to my love for the Domino, many a day I looked out the window listening to one come bouncing along and whining, the buses were named the bouncing bombs by drivers. By 1991 the entire batch were withdrawn, mainly due to poor fuel consumption and part avalability, and were replaced by dodge minibuses. Most of the batch, bar 45,48,49,50 & 53, were sold to Stevensons for further service. Amazingly, 53 was re allocated back into service for a contract at Greenland garage, and ran into late 1993 when Mercury bought 53. I worked at Greenland on work experience, and at the age of 15, after my obsession well known by friends for the Domino, I was told that 53 had come up for sale after Mercury sold out in 1995, this is where my story, and 53's started. I went down to Kent to see 53, with a friend and saw it laid up, albeit in a bit of a state as a lot of parts were missing, I bought 53 at the age of 15, nearly 16 and had the bus towed to Sheffield to live in the, what was, the Sheffield Bus Museum, ironically where 53 sat withdrawn back in 1991. The press soon got hold of it, and went wild, a 15 year old buying a bus was unheard of, I ended up on Calendar News, Sky News, the papers, and even on radio in Japan!, my parents also were on TV. But sadly I sold 53 in 1997/8, I had left school, discovered partying and that became more of a attraction than a bus that I was too inexperienced and young to fix, and life went on. Sadly in 2011 my father died, I had saved a further 30 odd buses in the 20 years I didn't have 53, and something always kept saying to me, 53 , why did I sell it. So after 20 years nearly, I contacted the guy I sold it too, and indeed 53 survived, in dry storage in and due to my history with it, the owner was willing to sell it back to me. I went to see 53, and it was untouched, after all these years it was exactly how I left it, my school books I hid on it, my old clothes I worked on it in, were all there like the bus was saying, were have you been?!. 53 had a lot, a lot of issues, the engine was in bits, loads of parts were removed, electrics disconnected lights missing, and a lot of unique parts gone, but I was determined to finish what I started. The hunt was on, and as I had gained a lot of mechanical experience by now, the engine side wasn't too expensive to rectify, Perkins were still around, but this proved costly, as 53's fuel pump drive had snapped, and thus having a bodged compressor coupling fitted, the whole lot was smashed. Wipers were missing, the whole rear electric isolator was missing, the dash was half gone, all interior lights gone, the door mechanisms and pipes ripped out, all the front panels either missing or damaged, motors for the wipers heaters all missing. These buses are so unique, rare and virtually impossible to get bits for, I cannot express how many hours and thousands of pounds it's taken to get 53 just to start, the amount of leg work for parts is untrue, but there laid a gem, a help I never thought I would get, or imagined, and that fell in the hands of Alton towers! C42HDT was sold from Stevensons, to Alton towers to act as theme for the ride, I contacted Alton Towers who said they would help, and indeed they did! 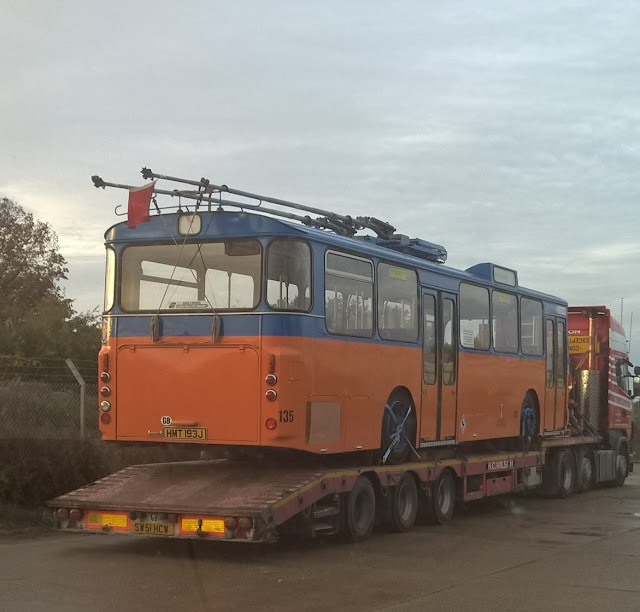 I went there and pointed out all missing items I needed, albeit the bus was missing a engine and gearbox, but the rest was there, and was removed and sent to me to get 53 back on the road! 53 had a major service and top end rebuild, and sprung into life and fired up first time in 20 years, the air system rose, it was amazing, after all this time I was getting somewhere. More time was needed fixing cut pipes, dodgy electrics, but a few weeks ago, 53 attempted to drive, and it did!, albeit in 1st and reverse only, but I'm at this stage now, where 53 is really coming along. More seals and electric works are needed to the gearbox, but I'm confident 53 will be on the road next year, I cannot express how hard it's been, but 53 is the only Domino left with its original 33 seats, and I'm lucky that the chassis is in fantastic condition. There's been blood, sweat and tears, the bus has nearly broke me financially many a time, so why do you ask?, Well The bus will be going back into little nipper when it's done, to relive the bouncing bomb moments of 1991, and to drive the bus to my dads resting place and say, dad, after 20 years, here he is! There's not much I can add to that remarkable story, but if anyone can help get this unique little bus back on the road them please get in touch. Let's make Iain's deeam of showing 53 off to his dad come true. Thanks for getting in touch, Iain - the bus world needs more people like you. PS I drove Dodge minibuses too and absolutely despised them! My Lords, Ladies, Anoraks and Gentlemen; It gives me great pleasure to announce that I have found a bus in East Anglia I can say nice things about. What's more it's a bus built this century. I headed over to Yarmouth today having been told that First's RML2480 was going to be out in service again. I wasn't the only one as many of the good, great and downright dubious of the enthusiast world had also ventured out of their comfort zone to try and get a glimpse of the sainted icon. Alas it was not to be, and 39480 remained stubbornly in the depot. However there was a great second prize. 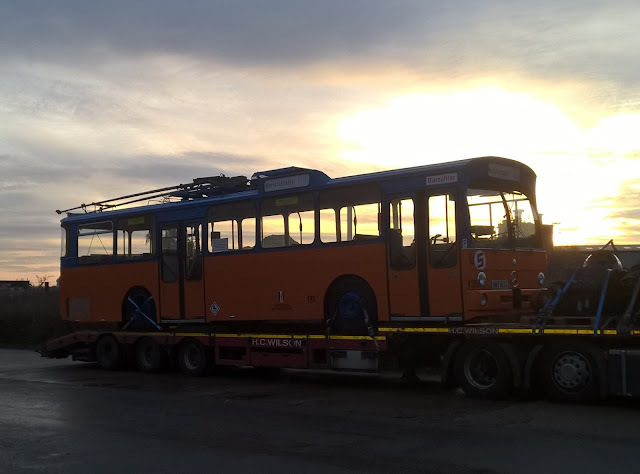 12 days ago two ex First Slough Geminis arrived at Caister Rd in Greenline livery. You can see the excellent report on East Norfolk Bus Blog by clicking here. Today one of them, 32348 LK53 LZL was back in Urban livery and made it's Norfolk debut on the 1420 7 to Belton. This was ironically the journey I was expecting the RML to be on so I boarded together with Cameron Robinson and Dan High to try it out. Comfortable leather seats and tables greeted us, in Yarmouth! This clearly pleased my companions! So let's strip down all the glitz and get to brass tacks. This is a 12 year old Volvo B7tl, that has spent a lot of its life hammering between Windsor and London on Greenline's 702, so naturally despite the leather and tables you would expect it to be a complete wreck. So did I. I was wrong. It is in immaculate condition. Barely a rattle, quiet, smooth and gives a lovely ride, even down the worst road in the country - Gorleston High St. Quite simply I cannot praise it enough and my mouth is watering at the thought of the other one, due to return in Excel livery sometime in the near future. It was also extremely warm on the Gemini and I'm half thinking about spending the winter on it - cheaper than heating my flat! It was a really nice surprise afetr the disappointment of the RML no show. I managed to keep the driver talking long enough when we got back to Yarmouth for Cameron to get in position to take a decent picture of her as she left Market Gates. One of the things I am insanely jealous of Cameron for is his eyesight. It is uncanny and he spotted a mistake in this picture. 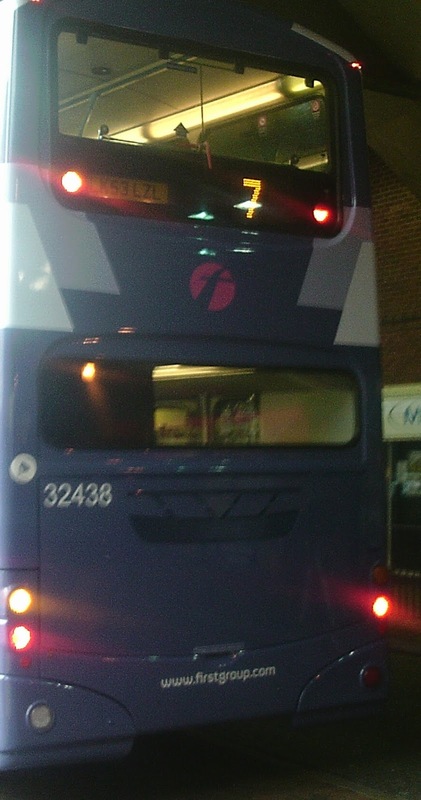 The fleet number is wrong, showing as 32438, not 348. On inspection of a picture of the rear I had taken earlier it transpired that the fleet number is wrong all over the bus. I suggest a few amendments are going to be made pretty quick so these pics could turn out to be pretty unique. I must add at this point that had the bus been rubbish I would have given Roy at East Norfolk Bus Blog the news to publish, which is what I do with most of the news I get these days. But it made such a change to ride a new decent bus in our area I thought I'd break my self imposed rule about publishing too much news and do it myself - sorry Roy! So while I'm here I can also report that Anglian on loan E200 YJ14 FHS has returned to its owners, as had Streetlite 353 MX60 GXA. 350, MX60 BWH should leave on Monday. Many thanks to my Anglian contact for the news. The whole world is going crazy this week due to the date being the one featured in the 1989 film Back To The Future II, which I confess I've never seen all the way through. However while all and sundry are discussing what they got wrong it suddenly struck me that had they gone back 26 years instead of forward two things would have been rather familiar. This week has seen First Yarmouth's RML2480 on regular service in the town. This RML dates from 1966, like myself, only has survived in better condition. OK it wouldn't have been around had Marty and Doc gone back to 1963 but the RM certainly was around then. Many thanks to Roy from East Norfolk Bus Blog for letting me use his pic, which he took on Monday, as a result of Grahame's tip off. So if you caught a bus in Yarmouth this week it could have been nearly 50 years old. I stress the nearly bit - plenty of time to go yet there really is!! Had you caught the train to Yarmouth the chances are it could have been even older, at least the locos involved. 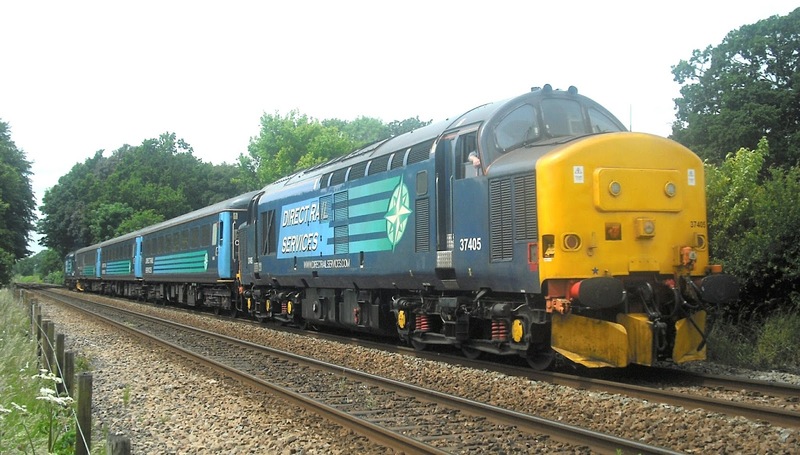 The short set, which runs between Norwich and Yarmouth/Lowestoft all day is propelled by two 1965 Class 37 locos, that are still arguably the most awesome locos ever made. Any excuse to republish my fav picture of the year, taken near Brundall Gardens in their first week of service on the short set on June 17th this year. 37405, formerly D6982 and 37282 heads to Yarmouth. The Class 37 locos were introduced from 1961 so again had Doc and Marty travelled back 26 years they would have been an everyday sight like the Routemasters. Then they could really have said they were going back to the future, with both iconic vehicles still transporting passengers around half a century into the future (I stress the "around" bit again!). Thanks to preservationists both should still be around for the next half century too. A wacky vehicle that I thoroughly enjoyed driving and can't tell you how good it was to discover is still around. Made my day! I have been looking forward to today for sometime. Back in Februrary I rode a batttery powered train and a Mercedes Citaro demonstrator that Ipswich Buses had on trial (see here). In that review I stated that I was so impressed with the Merc I emailed the then Managing Director of Ipswich Buses, Malcolm Robson, with one word - invest. Well invest they have and this week the three brand new Citaros entered service. It takes a lot to drag me to Ipswich these days but the prospect of spending a few hours riding around on these impressive looking buses was enough to brave the pouring rain for. Now it must be said that from the outside these buses looked exactly as I expected them to - attractive and enticing. I like IB's modern livery and think it suits everything it has gone on. I let 154 go as it was already full so of course the next two buses were the two Scania Olympus deckers. Eventually, though, 155 rolled in and I boarded full of anticipation. Immediately my vision changed from colour to black and white. Everything is grey. The seats are grey and grey, the floor is grey, the side panels and window surrounds are grey, the poles and grab handles are grey, the roof panels are light grey. It has truly got to be the most depressing and drab bus interior I have ever seen. Ever. But never mind I settled into my sumptuous seat to enjoy the journey. Oh hang on that's wrong I don't mean sumptuous do I. I mean rock hard. I have sat on softer wood. On the demonstrator I said the seats looked threadbare but were comfortable. These seats are not comfortable. Anything but. A complete disappointment in fact. When will operators learn that if people are going to leave their cars at home then the least they expect is a comfortable seat. You don't expect car passengers to sit on seats like that and they haven't waited 20 mins in the rain. Ipswich Buses have decent seats on all their other buses but these seats on the Mercs are appalling. For those of you watching in black and white you're missing nothing. Nothing at all. And then as we pulled away it rattled. I could see a loose roof panel and it wasn't just that I could hear rattling. Having said that the Citaro's suspension is awesome and speed bumps are effectively flattened - you cannot fault the ride in anyway.. But the engine seemed louder than the two demonstrators and sounded like a truck. I compared the demonstrator to the gas buses but not this one. One thing that was as quiet as a mouse though was the bell. In fact it's inaudible and passengers were checking the screen at the front to make sure it said "bus stopping". My intention was to do a rounder on all three of the Mercs but I ended up getting off 155 in Whitton, doing some shopping and catching 153 back to Ipswich. That was it. 153 was a lot better in that it didn't rattle at all. However, it took ages to board with my shopping due to a buggy jam. The 9/10 serve a part of Ipswich that to put it mildly has a few buggies. A lot of buggies actually, so you would have thought the design of the interior would have taken that into account. Not so. Even one buggy intrudes onto the aisle and I can see a lot of time being lost purely through buggy problems. In fact they may not last too long on the route. So to conclude: They look great but only from the outside. They are German so the engineers will love them as they will be extremely reliable. The ride is superb. But the interiors let them down badly. Colour, design and comfort are all lacking in imagination and with the customer in mind. The bell is silent yet the engine was louder than I expected. One is already rattling. In short they give the impression that the cheapest possible options in every area were chosen. I seriously thought they would be favourites for my "Bus Of The Year" award, but no. Had one of these been the demonstrator my email to Malcolm Robson would have contained two words not one - don't bother. How easy is it for you to collect a repeat prescription? A fairly basic task after all. Well today I had to undertake such a task and believe it or not it provides enough material for a post. There is no surgery in my village so it requires a visit to my old stamping ground of Wickham Market in Suffolk. Now if I was being lazy I'd use Suffolk Links both ways, which I'd have to do on a Wednesday or Saturday anyway, but since today was Tuesday I could patronise our local four times a week service bus to Saxmundham and continue to Wickham from there. Just one problem - since the latest round of First cuts it is now impossible to get from Saxmundham to Wickham Market (20 min journey) and back in the two and a half hour window available. So this is how my journey took shape. I started off on the 196 to Saxmundham. Operated by Stowmarket Minibus & Coach Hire this has to be just about the smallest service bus going, a 14 seater Transit minibus - slide your own door open. However I have always enjoyed using it. We used to have a really good Romanian driver who you could time your watch by, would get out and help the old ladies with their shopping trolleys and stop wherever you wanted. However he has left to go trucking and been replaced by a Cypriot driver who is a character and a half, you can time your watch by him, he gets out to help old ladies with their trolleys and will stop anywhere for you. If all bus drivers were like him there would be no cars on the road. I took a picture on my return which Lachio (probably awful spelling but that is what he said his name was) was more than happy to wait for me to take. At Saxmundham I switched from the smallest service bus in Suffolk to the second smallest service bus in Suffolk. On Tuesdays and Thursdays the 62, which is operated by PF Travel of Woodbridge, extends from Framlingham to Saxmundham, which means on those days I can actually get to Wickham Market by service bus, as the 196 now misses the re-timed 64 by 10 mins. A Mercedes Sprinter minibus awaits, again open your own door, but an equally friendly driver, who has a great taste in music, is ex FEC and recognises the need for these little rural buses. Just one thing - there is no mention of the service on the bus stop timetables in Saxmundham. I alerted Suffolkonboard to this last week but still nothing. No one's going to use a service that isn't advertised. However I again like the service, use it whenever I can, not only from Saxmundham to Wickham but also from Woodbridge to Wickham or Framlingham when coming home from Ipswich. It's important it's used. So I got to Wickham Market ok to get my rescription but how to get back. No 64 back to Sax in time to connect with the 196 and no 62 either. Only one thing for it - Suffolk Links to the rescue. I had initially booked to go straight back to my village, but had second thoughts, changed it to Sax so I could both pop into Tesco and patronise the 196 home. I wasn't expecting a very round the houses journey to Sax though and had to do a trolley dash round Tesco Dale Winton in his Supermarket Sweep days would have been impressed by. But I got out of Tesco in the nick of time for Lachio to pick me up and so everything worked out ok. A bit of an expedition though just to get a prescription. Now a few points to make. Devising that journey wasn't easy. It meant scanning timetables to calculate journey times, when to book Suffolk Links and it nearly fell flat on its face when the journey back to Saxmundham took longer than anticipated. A bit close when the next bus back to my village is Thursday! I'm lucky in that I know where to find information, know the bus network, when certain services go certain routes and so on. Not everyone does. It doesn't help when timetables are not even displayed to bus stops, and even then the new style of timetables that you can't see when you'll get somewhere or when you can get home again are as good as useless. 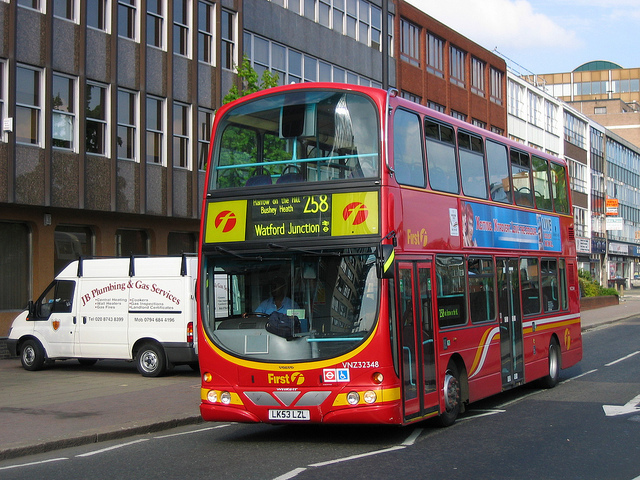 The way bus services are advertised and displayed needs to undergo a complete rethink again. Secondly I'm also fortunate in that I have a bus pass. not fortunate as to the reason why as my eyes are giving me serious grief again at the moment, but had I had to pay today I would have had three separate fares - a return from my village to Saxmundham on the 196, then a single to Wickham Market on the 62, then another single back to Saxmundham on Suffolk Links, yet all three services are sponsored by the Council. When I was in Stornoway in May, where all services are sponsored by the Western Isles Council, any ticket is valid on any bus, so you can get a return to somewhere with one company and use that return to get back on another. Why don't we have that here? Why isn't there a day ticket that is valid on all Council sponsored services including pre-booked Links services? Why isn't acceptance of that ticket a condition of tender? Might get a few more bums on seats then. As I see it right now there is no incentive provided anywhere by anyone to encourage people to use buses more not less. A shame as these little buses are worth their weight in gold, and the drivers are just brilliant. A bonus post today - wasn't planned but these three items caught my eye in a short space of time and I thought I'd share them. Now what do you think of when I mention French Railways? Modern, sleek, extremely fast SNCF trains hurtling South? Rubber tyred double deck Metro trains in Paris? Yes me too. However it appears there is another not so well known side to French Railways - yes you guessed it - rural services. In some spots there can be only one train a day down wooden sleepered, overgrown tracks, and unreliable with it. In other areas commuters are having to catch trains earlier than the ones they need just to get to their destination on time, and the passengers have had enough. So what are they going to do? Well they're going on strike. Yup the passengers are going on strike. But it is a very specific sort of strike. For two days passengers are going to refuse to show valid tickets, instead showing a fake protest ticket which outlines their grievances. I know the French have recently caused absolute misery and chaos in Kent with the blockades of French ports but you also have to have a grudging respect for the French people. When they say "non" they mean "non". They don't just whinge about things they do something abut it. I can't help wondering what the scene at Liverpool Stt would be next time everything goes belly up (probably sometime in the next 10 mins) and everyone refused to show their tickets at the barriers. Anarchy! Anyway to read the full story in Mailonline click here. Finally I was doing a bit of channel hopping after the lunchtime news today and caught the last part of Chris Tarrant's quite excellent programme on extreme railways around the world. 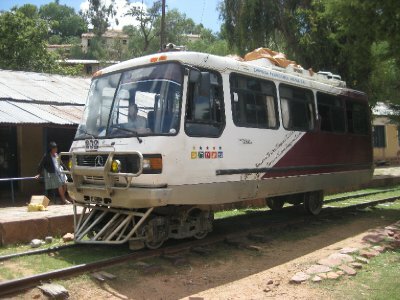 This week he was in Bolivia, and it could be said that the rail network there is in even more need of updating than ours. However they have solved the shortage of rolling stock by using replacement buses. Literally. I present the Mercedes minitrain. How ingenious. Only trouble is it's not that fast, the line sometimes disappears underwater and some gradients are so steep the co driver has to get out and put earth on the rails just so the train erm bus can get a grip on the rails. The entire journey takes a whopping 7 hours but passes through some of the most stunning scenery imaginable. I was lucky enough to find a website with many pictures and description of the route, and you can also watch the programme on Channel 5's catch up tv. To access the website click here. This gave me an idea. Are there any heritage railways around that don't have any bridges or tunnels? If so I think a good project would be the Volvo Olympitrain. Any takers? Since I started voicing my concerns about rural transport I have heard that a lot. People saying that as I chose to live in the country I must have known what I was letting myself in for. Well it's not quite that. When I moved to Wickham Market from Ipswich as - and I know I was being selfish - I didn't really want to live in a rabbit hutch bedsit or a run down drug ridden estate the main box that was ticked was buses. 2 buses an hour to Ipswich, Sunday and late evening buses. Now, as I have well publicised there are 6 buses to Ipswich a day, nothing evenings and Sundays. All that in the space of less than 7 years. When I moved to my current village I had a car - incidentally it took me over 6 months to find somewhere I could afford - but it proved financially impossible to keep it on the road. Since I moved here, again, existing services have been cut. If I had a crystal ball not only could I have seen those cuts coming but I'd have also won the lottery several times, have bought my own island somewhere exotic and wouldn't give a flying E400 about transport anymore. So those who say those living in rural areas have made their bed so should lie in it know what they can do. But it's not only the buses is it. Let's be even handed here. All the Greater Anglia ads recently have been about how cheap advance single tickes to London are, the 2 for 1 offers available once you're up there and so on. Sounds tempting doesn't it. So imagine you live in Leiston and want to go to a London show, taking advantage of the offers Greater Anglia are proudly boasting. Let's even imagine you have a car. So you drive to your nearest station, which would be Saxmundham, catch the train to Ipswich (no through trains to London now), change on to the fast modern mainline train - oh sorry got that wrong - your 40 year old coach pulled by a 25yo loco, and if you're really lucky there won't be any signal failures, points failures, overhead line failures, broken down freight trains, suicides, deer on the line, inconveniently shaped snow, excessive heat or Autumn, and you'll get to London in time for a relaxing drink and a meal before settling down in your plush theatre seat, watching the best the West End can provide, before making your way back to Liverpool St. Unfortunately though to make up for your 40yo coach and 25yo loco Network Rail are putting down some fresh, comfortable ballast to justify their existence. This means your train terminates at Witham and you have to get a bus to Colchester, onto another train which hasn't yet been cleaned and is full of beer cans and burger wrappers to Ipswich where you discover the last train to Saxmundham left 3 hours ago and you are stranded. Ok that is a bit of a worst case scenario - although evening trans have been disrupted for months now due to ballast being replaced. But the crux of it is true. The last connecting train from London for the East Suffolk Line is 2100, before the second act has started. So we'll abandon London despite Greater Anglia's attempts to lure us there and settle for a romantic evening in Ipswich - titter ye not - the Regent has some great shows and there must be some good restaurants that aren't kebab shops somewhere. However do check what time the show finishes and be prepared to run the mile back to the station as the last train to Sax leaves at 2217. Actually you're better off driving the whole way then you won't have to rush. How about a fun night in Lowestoft? Ok I'm being silly now but the last train to Saxmundham from Lowestoft leaves at 2107 so even if there was something you wouldn't be able to do it. To put it bluntly if you live in the sticks and want a social life you either need to drive or be rich enough to afford some very expensive taxis. This in no way ties in with the Government's apparent wish to get people out of their cars and back on to public transport. Mr Cameron, and indeed Mrs Coffey - you cannot use something which doesn't exist, and if something is only supplied in extremely limited quantities people won't use it anyway as they will find an alternative. All these houses your crusade is going to build - will the social infrastructure, including public transport be included in the crusade? I said I would put my head on the block over this so here goes! You've read the criticism so it's only fair that I say how I would try and stop the Anglian rot. Now obviously I don't have any of the figures or budgets, or commands from Newcastle. What I do have, however is experience of travelling hundreds of miles on Anglian routes a week, and although the eyes still aren't right there is nothing wrong with my ears and I keep them open to what people are saying. Also I have not heard of a single instance of Go-Ahead management travelling on their own services asking their own customers what they want. All their research seems to come from a computer, and we have all heard the phrase lies, damn lies and statistics. Let's start with the 7, which has the unenviable task of competing with the X1. Anglian put a lot of noses out of joint when they abandoned the former A47 serving the likes of Brundall, basically sacrificing those passengers in an attempt to muscle in on the fast services between Norwich and Yarmouth. However, they still decided to run the services via Thorpe, so Norwich Station could be served. A good idea, but already it meant a longer journey time. These days time is everything, so what does the 7 have that the X1 doesn't. Basicaly nothing. It's no secret that I think the gas buses are the best single deck buses ever built, but that is totally irrelevant. We are talking about normal passengers who couldn't give a monkeys if their bus ran on gas or ham sandwiches. The 7 doesn't have wifi, leather seats - gas bus seats are great but the Scanias are as comfortable as racing bike saddles. The 7 doesn't have air chill, and quite significantly for what is a major tourist route, it has no top deck. You bring the kids on holiday and where do they want to travel on a bus? Exactly. So the 7 has all that against it so what can be done to get bums on seats? How about running buses when people want them. You would not believe the number of times I have been waiting at Yarmouth listenng to people asking Anglian drivers when the last bus back from Norwich was, then expressing surprise at the early time. This leaves passengers without flexibility if anything goes wrong, or plans need to change. At the moment the last 7 leaves Norwich at 1840. From November it will be 1800. That means even more people will revert to the X1 as they will be able to return when they want to, not be forced to return by 1800 at the latest. Therefore if you are going to effectively compete with an established route like the X1 you need to give people more not less. So I would trade in all the Scania Omnilinks for deckers that had decent seats, look into the possibility of wifi which despite my initial misgivings seems to be gaining in popularity, and run evening services so people on a day out could have a whole day out and make sure those services connected with trains from London at Norwich. Run promotions with various establishments in Norwich and Yarmouth to encourage use of the evening services - you can't just expect passengers to turn up these days. I now worry for the 61. So much that it would surprise me if it survives another 6 months. You simply cannot survive charging 140% more than your competitor. 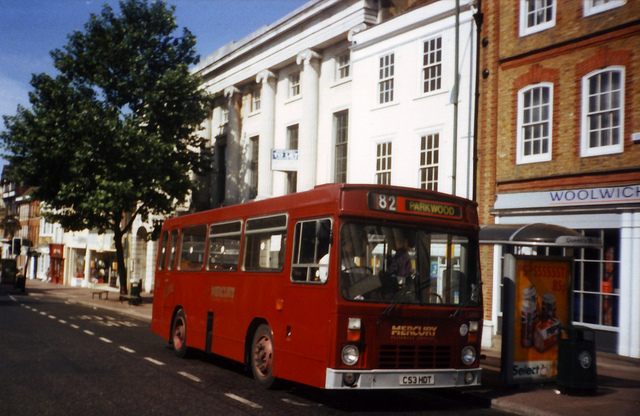 The 61's saving grace was that firstly it continued to Yarmouth, and secondly that tourists weren't aware of the fares discrepancy between the 61 and 99. It also runs through to Southwold, although I am reliably informed that many passengers from Southwold, Reydon and Wangford are abandoning the 61, catching the 146 to Pakefield then changing to the 99 into Lowestoft. Kessingland Beach has all but been abandoned, and with the service now terminating at Lowestoft the fares to Yarmouth from Kessingland and Pakefield have effectively been raised unless through fares will still be available, which I very much doubt. Oh and if you're travelling from Lowestoft to Halesworth via Southwold - which you have to do now both the 62 and 60 have been axed you'd better hope that bridge doesn't go up as you have precisely 4 mins at Southwold now to make your connection. If you want to go to the pier, as many from Pontins and Lowestoft do in the Summer than forget that too - the 61 now terminates at the King's Head and the 88 which now goes to the pier leaves 10 mins before you get in! Also the busiest 61 out of Southwold is currently the 0922 from Southwold Pier, so of course that's gone and replaced with a 1005. BorderBus must think Christmas has come early! I would therefore run the 61 to Pleasurewood Hills, whch is a far easier place to change than the cramped Lowestoft Bus Station - persuading the Council to provide better shelter facilties. 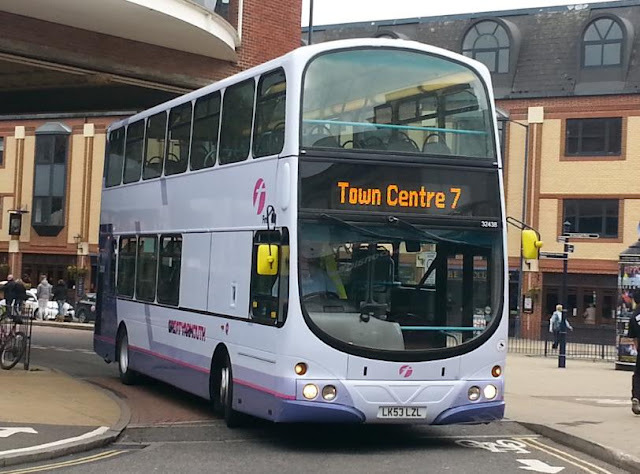 The 7 could then run along the X1 route between Lowestoft and Pleasurewood Hills, thus reducing journey times, yet Gunton and Lowestoft College would still served with through buses from Southwold and Kessingland. A new all day ticket of £5 covering the length of the 7/61 routes would be introduced thus preserving the fares currently paid and obviously I would match First's fares on the 99 - it was tantamount to suicide to ignore that. A trick has been missed with the 88. I know the morning X88 from Halesworth is extremely popular so why it has been withdrawn truly baffles me. The afternoon one would take more if it didn't leave at exactly the same time as the Bungay stopping service. When I heard that more X88's would be running I was feeling very positive, but it seems it is no more than a re-numbering exercise, with the services running no faster than the currrent 88's. Passengers from Halesworth and Bungay are crying out for faster services to and from Norwich and the new timetable has improved little if anything. Again it shows how out of touch with their customers Anglian are. If Brooke really needs a half hourly service (I'm not convinced) then one of the 87's should extend out there instead of serving Stoke Holy Cross, which certainly doesn't need a half hourly 87 as well as the 84's. That would allow the X88 to run faster as it should do. I am utterly confounded by the cuts to the 80/81. No matter where on the route I have been it has been well used. The fast link between Beccles and Bungay was very popular too. I regulaly use the route between Beccles and Yarmouth and I'm so surprised at these cuts. 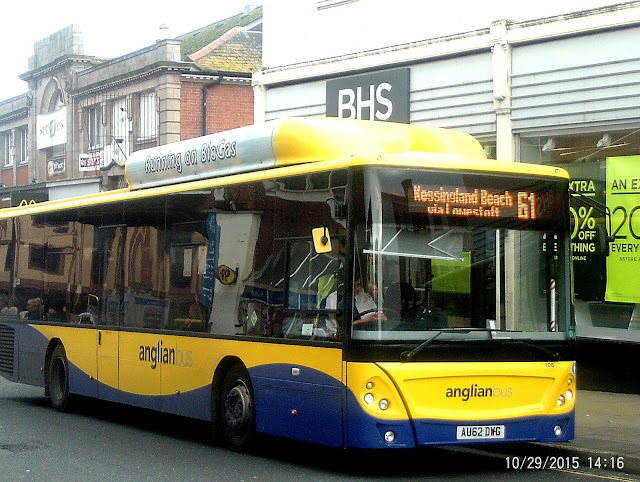 Anglian have said all journeys will from November be operated by "larger buses" to cater for the extra loadings. They may have 10 or so more seats but they won't have any extra buggy, trolley or wheelchair spaces. Also with some journeys operating via Aldeby it's going to be pretty tight round there too. But at least you'd think that with only 7 journeys a day now Anglian would at least make sure there were easy connections with other routes. Think again. If you're travelling from Halesworth and want to change at Bungay for the 80 you have a 30 min wait if you want to go to Diss and a convenient 45 min wait to go to Beccles and on to Yarmouth (first connections after 0930). If you catch the 60H to Beccles from Halesworth thinking that will be better I'm sorry - if you're going to Yarmouth you'll have a short wait of 81 mins. Only 5 mins if going to Bungay but quicker to go direct from Halesworth anyway. Coming back from Yarmouth you won't be surprised to hear that it's no better - buses from Yarmouth arrive at 1301, 1501 and 1647 wih the 60H leaving at 1416 and 1616. Anyone else get the impression that things are being made as awkward for the passenger as possible? Surely it would have made more sense to extend the 60H and 60S from Beccles to Bungay, either as the 60 does now via Gillingham and Kirby Cane, so the 80 can stay fast between Beccles and Bungay, or fast itself. It would also make sense to make sure everything connected with each other. I'm not claiming my ideas to be perfect, or a miracle cure. But they have been created based on travelling on the network, and listening to passengers. Maybe if Anglian had done the same they might not be in such a mess right now. Services should encourage paseenger use - after all if they don't no one's going to use them leading to more and more cuts. I see no passenger encouragement from the latest Anglian timetables. Really wish I didn't have to be so negative, and if anyone can find anything positive to say I'll happily shout it from the rooftops!